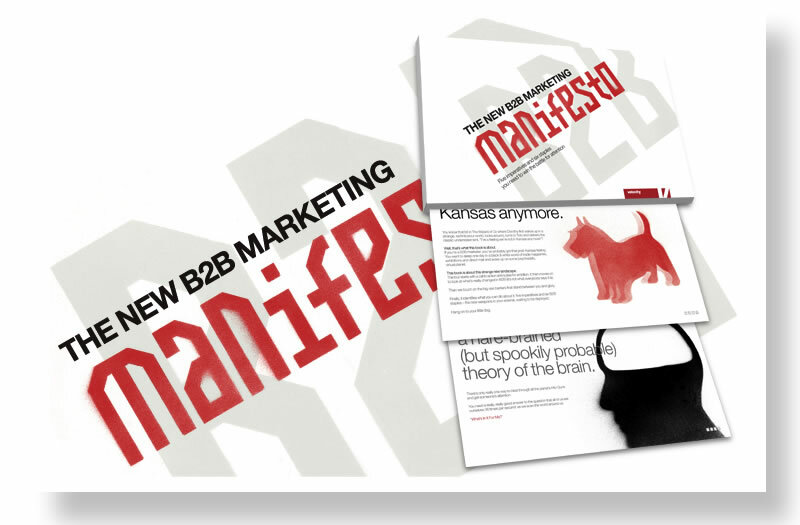 As part of our B2B Marketing Manifesto campaign, we asked a single, simple question in the download form. Tucked under the boxes for name, e-mail and company name is the optional question: “The hardest part of B2B marketing is____ ." To be honest, we threw this question in as an afterthought but it’s proven to be one of the most interesting things we’ve done in the Manifesto campaign, so we’d like to share it here in our "living case study," Project Open Kimono. Let’s admit right out front that this "micro-survey" isn’t particularly scientific. 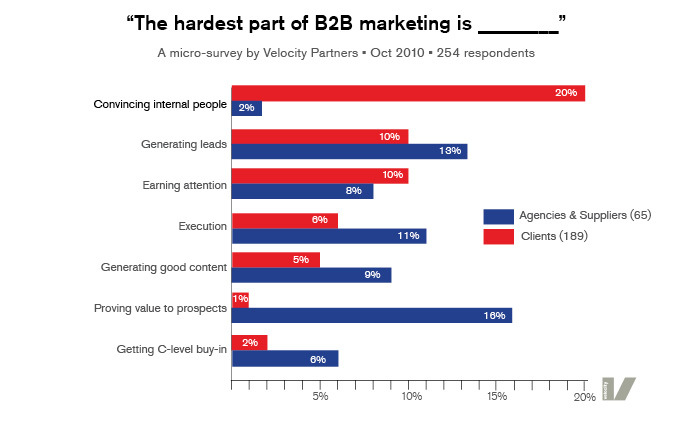 It’s not a random sample of B2B marketers (just the kind who download things like B2B manifestos) and the question itself is open to many different interpretations (like what do we mean by "hardest" anyway?). But the results are even better than rigorous: they’re interesting. And they really do make me think a bit differently about B2B. 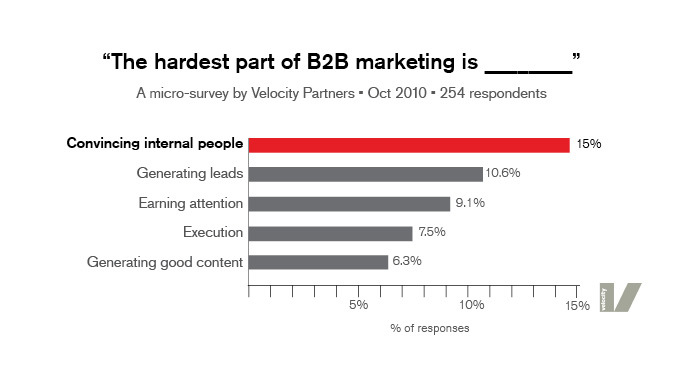 Because what it shows is a kind of snapshot of the state of mind of B2B marketers today. Not a detailed analysis of our priorities but a peek into how we think about our work. The fact that this was a top-of-the-head question rather than a "sit down and take a survey" kind of experience might even make it more valuable as a mindset indicator. 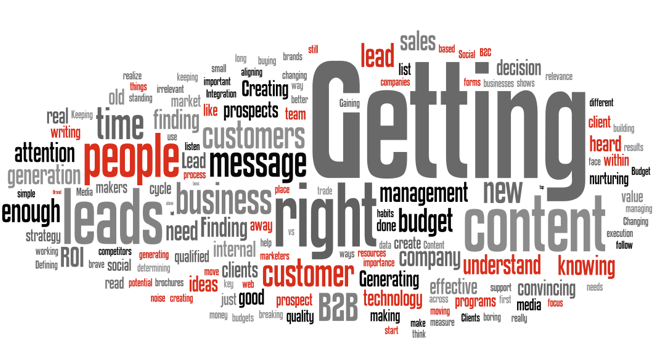 The Wordle of all the responses (above) reads like a CAT scan of any B2B marketer’s brain. One rather shocking result jumped out of this little exercise: the number one obstacle B2B marketers identify has nothing to do with actually getting through to prospective buyers, winning their attention, convincing them to engage or getting them to buy. The number one obstacle isn’t about creating great content, generating high-quality leads or proving ROI (though all of these showed up in the top five). The hardest part of B2B marketing is fighting internal battles. Think about this. Of all the incredibly challenging things we all have to struggle with, we’re most daunted by getting our bosses or boards or other departments to value us, listen to us and take our advice (these are the kinds of words people used—they’re masked by our aggregated term “Convincing internal people”). I don’t know about you but seeing this in the cold light of Excel kind of gave me a kick in the head. Why would this be so? I hate to say it but it’s probably because the doubters are absolutely right: B2B marketers have not earned the respect of our peers and our bosses because we have not delivered clear, undeniable value to our businesses. Part of this may be that B2B businesses are less likely to be "marketing driven" than consumer marketing companies are (I could be wrong but I’d be amazed if B2C marketers were as concerned by internal obstacles). In Nike and Coca-Cola, marketing is the most powerful department not one of the least. Rightly or wrongly, B2B companies are often more sales-driven or engineering-driven. You don’t find many consumer brands that aren’t all about the marketing. As you can see, the agency side didn’t really rate the internal problems highly at all. They did, however consider things like “Proving value to prospects” and “getting C-level buy-in” as the hardest part of their jobs — far higher than their client-side peers. So it seems safe to say that many B2B marketers within companies are struggling in their efforts to be heard, valued, respected and left alone to do what they know is right for the business. The B2B Marketing Manifesto is really all about this challenge: how marketers can thrive in The Land of Accountability” — and prove our value as we do it. So the first action is to read the damn thing and see if it inspires a new way of thinking about your job. Then, it feels like it’s time for some soul-searching: How much value are you really adding to your business? Can you prove it? Have you shown the evidence to the important stakeholders? If the answer is ‘no’ to any of these questions, here’s a follow-up: Why not? B2B marketers of the world: Rise up! We have nothing to lose but the poor opinion of our peers . . .
What do you think? We’d love to hear your views on this. Doug Kessler (doug@velocitypartners.co.uk) is co-founder and creative director of Velocity, the London-based B2B marketing agency. Velocity helps clients tell great stories, then drive those stories into the market using content marketing. Doug wrote Velocity's "Content Marketing Workbook" and "Social Media Checklist" and is about to release "The New B2B Marketing Manifesto." Download Velocity's eBooks . . .
It’s not about social media, the Web, or e-mail. It’s about a completely new mindset, new buyer behaviors and a shiny new set of tools to address it all. Download it and see what you think . . . 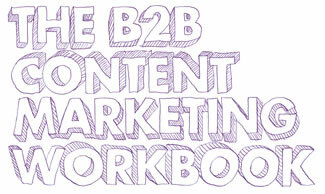 Content Marketing is probably the single most important weapon in the B2B marketing arsenal. This eBook takes you through Velocity’s approach to the art. Download it and see what you think . . .